Four mothers posing in a corridor of the Hospital in Bili. All four of them are staying in the hospital with their child, that's suffering from a severe case of malaria. We respond to emergencies and assist people fleeing violence and armed conflict. In 2018, we responded to two Ebola outbreaks, in Equateur and North Kivu provinces respectively. We run some of our largest programmes in the Democratic Republic of Congo (DRC), working in 20 of 26 provinces and responding to diseases outbreaks, conflict and displacement, and health problems such as HIV/AIDs. The population has little access to healthcare, and outbreaks are frequent due to poor surveillance and infrastructure. Violence has led to crises in the Kivus, Tanganyika and Kasai regions and forced millions to flee. Three of our staff, abducted in North Kivu in 2013, are still missing. 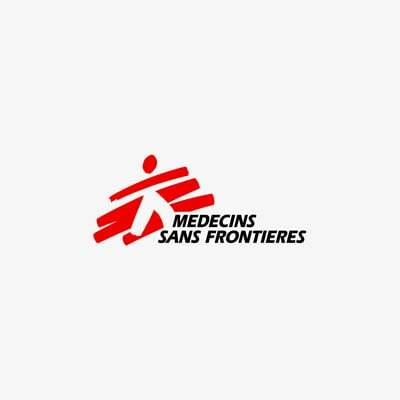 March 2018, Ituri, Democratic Republic of Congo: Bawma Yoame, 56, recovers in a hospital room in Bunia, after an attack on his village left him severely wounded with multiple lacerations to the head. Armed conflict has triggered massive movements of people and their needs are immense. We provide emergency responses in the areas affected, notably currently in North and South Kivu, Kasai, Ituri and Tanganyika among others. We treat the wounded, cover basic health needs and adapt our services accordingly. An MSF physiotherapist and a patient with advanced HIV at CHK hospital, Kinshasa. We support the national HIV/AIDS programme, which is implemented by the country's health authorities. Our teams work on improving access to screening and treatment, reinforcing treatment adherence, and patient retention. Awareness-raising through community-based activities is an important part of our projects. Abduraman, a nurse at an MSF-supported health centre, carries out a malaria test, North Kivu, Democratic Republic of Congo, 13 February 2017. According to official statistics in DRC, malaria causes four times more deaths per year than conflict, meningitis, cholera, measles and respiratory diseases combined. Children are the most severely affected. Most of our projects include malaria care. We also carry out emergency interventions to contain outbreaks. DRC is prone to outbreaks of infectious diseases, such as measles, yellow fever and cholera. We run mobile teams, which can be quickly deployed in emergencies. Among our responses to outbreaks of communicable diseases are vaccination campaigns, case management (including surgeries), health promotion and water and sanitation activities. Ebola outbreaks are also recurrent in DRC, and we support local authorities in the response. Ajabu, 30 years old, is waiting to give birth at the ‘welcome village’ for pregnant women at the Masisi Hospital in the Democratic Republic of Congo. Women may be accompanied by another woman to help prepare meals for them, or bring their younger children if there is no one to care for them while they are staying at the facility. She has had ten pregnancies in the past, but has only five surviving children. Many of our projects have an important component of women's health. Sexual violence is also a major issue in DRC, affecting men and boys as well as women and girls. We provide medical and psychological support, organise family planning activities, antenatal and postnatal consultations, and treat patients for sexually transmitted diseases. February 2017 – A severely malnourished child stands as MSF staff measure his height at an MSF-supported health centre in Bukama, Masisi, Democratic Republic of Congo. In 2017, we observed an increase in admissions for malnutrition in all our medical structures. This is due to violence-triggered displacement, a bad agricultural season, and less funding. We are treating malnutrition in North Kivu, South Kivu and Kasai provinces. Nearly 1 million people die each year from HIV/AIDS, while nearly 2 million people become newly infected with the virus. Ebola and Marburg haemorrhagic fevers are rare but deadly. Outbreaks can kill 25 to 90 per cent of those infected, spreading fear and panic. No cure exists and treatment is mainly symptomatic.